Your Zoho Mailbox is integrated with the Zoho Notes application. It is an easy way to make sure that all your spur of the moment ideas are not lost. With options to embed images and attachments, the Notes application brings in an easy to visualize interface. The Notes application can be accessed from the left pane in your Zoho mailbox. You can create individual Notes, to jot down your ideas, draft content, reference texts, quotes from websites and so on. You can embed relevant images in your Notes, which makes your Note more meaningful any time you look at it. From the Notes preview pane, you can add attachments such as images, audio clips, and files to your note. Further, these notes can directly be sent as an email along with the embedded images and attachments. On opening a particular note, options for commenting on the note, adding invitees etc. can be viewed. 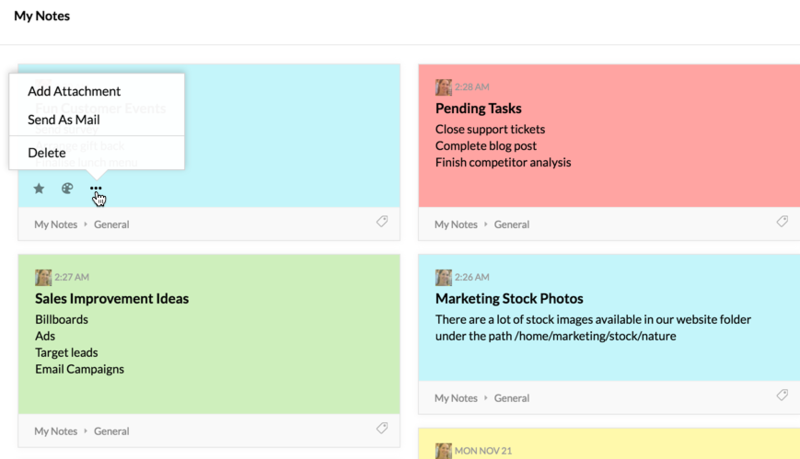 You can directly create Notes under Groups. Notes that have been added to Streams can directly be posted to the relevant Group notes section. 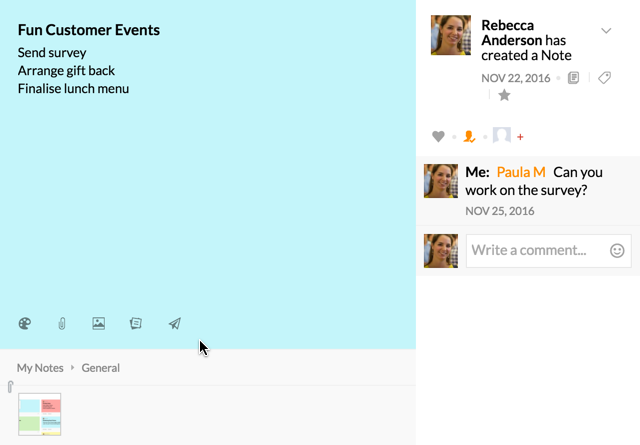 When you create a Group Note, the group will be notified when you make changes to the Note. Group notes created by those other than you, can't be edited. They can only be marked as favorite, tagged, sent as emails or commented on.